According to Hill. M (1997: 6) pyramid table is very effective for organizing information in a majority/minority or general-to-specific manner. A pyramid table can also be used to list details or facts leading up to a climax or culminating event. Have students start at the bottom of the pyramid if you would like them to work from a general-ization to a more specific idea. Pyramid is a triangle table that consist of wordlist from majority to minority. In addition Preszler. 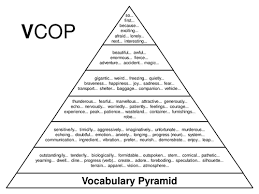 J (2006: 18) The pyramid helps students determine the common attributes of a list of vocabulary words so they can name the category describing the terms. a) Divide a triangular template into six sections. Assign points to each section. b) Identify pairs of students and select one student in each pair to begin as the clue giver.Explain that the clue giver is the only one able to see the pyramid template with thecategories listed. c) Cover categories at the beginning of the game. Uncover categories, one at a time, as the are guessed. d) Explain that as the clue giver gives clues associated with the category listed on the pyramid, the guesser attempts to correctly identify the category. When the guesser is correct, the clue giver moves on to another section of the triangle and repeats the procedure. A time frame of 30 seconds is given to guess each category. Belum ada tanggapan untuk "PYRAMID TABLE IN VOCABULARY"